As its scientific surname indicates, it is one of the most enigmatic animals that inhabit the seabed of our planet. The first part of its scientific name refers to the Deepstar 4000, the submarine robot designed by Jacques Cousteau that allowed to discover this species at 723 meters of depth in 1967, off the coast of San Diego (United States). 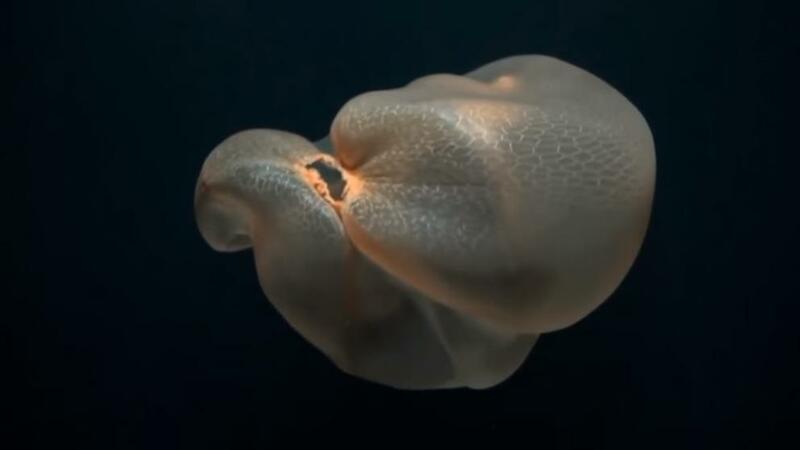 Deepstaria enigmatica is a jellyfish of the family Ulmaridae, considered by experts as one of the largest and most mysterious invertebrate predators from the depths of the sea. Human beings have encountered this jellyfish only on a few occasions and many questions related to its biology, distribution, diet, environmental tolerances and behaviour remain unanswered. Last November a team of researchers led by David Gruber, from the Department of Natural Sciences at the City University of New York, captured high-quality images of a specimen of this enigmatic species with the help of cameras installed on the robot submergible Hercules of the Nautilus submarine NA092. The results of this observation and subsequent studies are published this May in the specialized journal American Museum Novitates. The formal description of the species occurred 45 years ago, almost six years after its discovery, using a fragment of an accidentally captured specimen. Since then only very limited samples have been obtained, mostly from fishing nets, and two filming of specimens in their natural environment. In this almost half a century of studies, it has also been possible to describe a second similar species, the Deepstar reticulum. The new and valuable observation of this type of jellyfish with the appearance of plastic bags occurred in the Pacific Ocean, near the island of San Benedicto (Mexico). The data accumulated so far indicates that the Deepstaria live at depths ranging from 600 to 1,750 meters. The specimen described in the new study measures 68.3 centimetres in length and 55.7 cm in diameter. The authors detail that they were able to observe this specimen capturing or “bagging” its prey (small crustaceans) and describing its varied and delicate movements in the marine depth.